Hemos creado un mapa de Onlinefreespanish para ayudarles a encontrar de una manera más fácil las lecciones que tenemos. Tienes escoger cada uno de los niveles y te aparecerán las lecciones que tiene cada nivel en una lista. Puedes escoger en esa lista la lección que quieres usar. ¡Esperamos sea de utilidad este mapa de OnlineFreeSpanish! Déjanos saber cualquier duda que tengas. Si tienes amigos con los que tu crees que puedes compartir nuestro sitio, te agradecemos hacerlo, es una herramienta muy útil y gratis para las clases de Español. 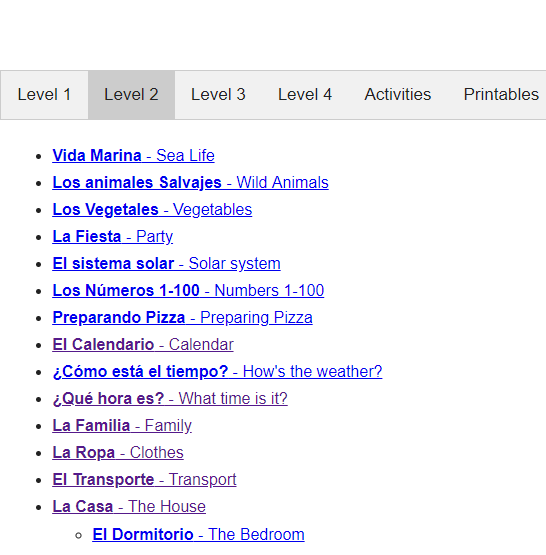 We created a sitemap for OnlineFreeSpanish; the idea is to help you to find a lesson easily! You need to select any level that you want, and then you can see a list with all the lessons that this level has. In that list, you can choose the lesson that you want to use it. We believe this sitemap will help you! Let us know any doubt or question that you have. If you have friends that you think can use our site, please share it with them, we thank your help for sharing OnlineFreeSpanish resources where all is free!